Native to the lowlands and montane rainforests of the Himalayas, India, Laos, Myanmar, Thailand, and Nepal, Wallichia disticha is just one of seven species within the genus named in honour of Danish botanist Nathaniel Wallich (1786-1854). The species name 'disticha' is derived from the Greek 'dis' and 'stichos' (meaning two lines), a reference to the two opposing rows of leaves. It is also the only species within the genus with this unusual leaf arrangement making it both a handsome and desirable species. The arching, pinnate leaves are approximately 2.4-4.5 metres long. Commonly known as the False sugar palm, Wallichia disticha is a fishtail-like palm with a solitary trunk and large, stiff, feathery leaves which form from (usually) a single trunk. 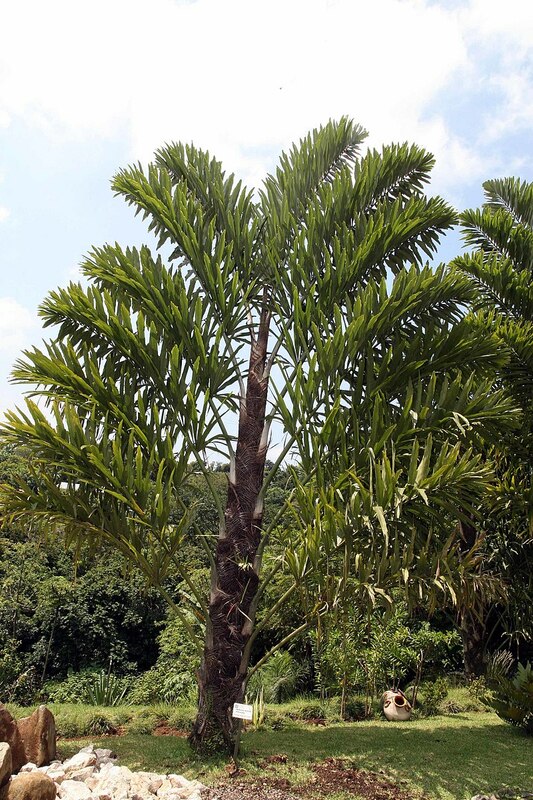 Under favourable conditions you can expect Wallichia disticha to reach an overall height of between 6-9 metres. The canopy is usually half that of the height. Specimens that are cultivated in dry or infertile soils will tend to produce smaller leaves and be smaller in height. It is an easy to grow species that will perform best in a reliably moist sandy soil in full sun although it will tolerate half-shade in hotter climates. That being said it has proven to tolerate clay and loam soils which can also be slightly alkaline or acidic. Water during extended periods of drought, and improve drainage where necessary to prevent the roots becoming waterlogged over the winter as this cause the premature death of the plant. Feed with a liquid fertilizer rich in micronutrients (such as a liquid soluble seaweed-based fertiliser) to prevent nutrient deficiencies. Low levels of iron and magnesium can cause characteristic yellowing known as chlorosis. Micronutrient deficiencies are usually known to occur in acidic soils. Wallichia disticha it is widely cultivated in subtropical and warm temperate regions and is surprising cold hardy capable of surviving freezing temperatures down to -2 degrees Celsius. Even colder temperatures can be survived if only for short periods. 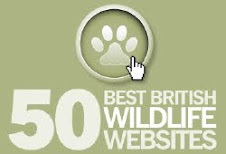 This means that it is possible to grow Wallichia disticha outside in the milder regions of Great Britain. Once established avoid moving as the root system of this species is particularly sensitive to being dug up. This will often result in shocking the plant causing it to prematurely come into seed and then die. 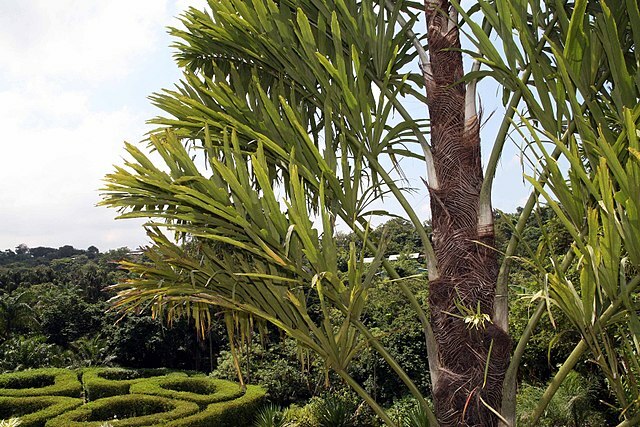 Very little maintenance is required other than to remove any diseased, damaged or drying leaves, but do not prune until all of the leaf's green colour has disappeared. HOW TO GROW THE TEA PLANT FROM SEED? Tea may no longer be the hot beverage of choice in England, but there are still approximately 165 million cups drunk within this emerald isle every single day. So with a nice hot cup of tea still up there across the nation why not consider growing your own tea plants and producing your own brew from freshly harvested leaves? 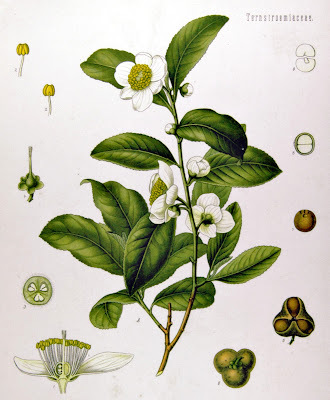 The botanical name for the tea plant is Camellia sinensis, the genus name of which will be familiar to most gardeners for its floriferous cousins. Now despite popular images of Tea plants being picked in exotic, tropical locations, it is a surprisingly hardy species capable of surviving all but the harshest winters that the UK can throw at it. First purchase 'as fresh as you can' tea seeds from a reputable seed supplier. Then before sowing, soak the seeds in tepid water for a day or so. Using a good quality, ericaceous, soil-based seed compost fill a large modular seed tray of 9 cm pots. Alternatively, create your own compost by mixing 50:50 John Innes 'Seed and Cutting' compost and Ericaceous compost. Press one seed into the centre of each pot or module with the eye of each seed facing upwards and cover with a thin layer or vermiculite, horticultural grade lime-free grit, perlite or compost. Gently water in and to help retain moisture, humidity as well as a warm rooting medium to encourage timely germination, place the tray or pots inside a heated propagator with a temperature at approximately 16-18 degrees Celsius. Alternatively, seal inside a clear polythene bag and place on a warm, bright windowsill, but out of direct of full sun. Water using a mister to keep the compost permanently moist but never allow it to become waterlogged. Tea seeds will germinate once overnight temperatures rise above 12 degrees Celsius, emerging from 4-6 weeks onwards. Once germinated, remove the pot from the polythene bag or propagator. Modular sown tea seeds will need to remain until most of the seeds have germinated but you will need to keep an eye for fungal infections which can flourish in the warm humid conditions. 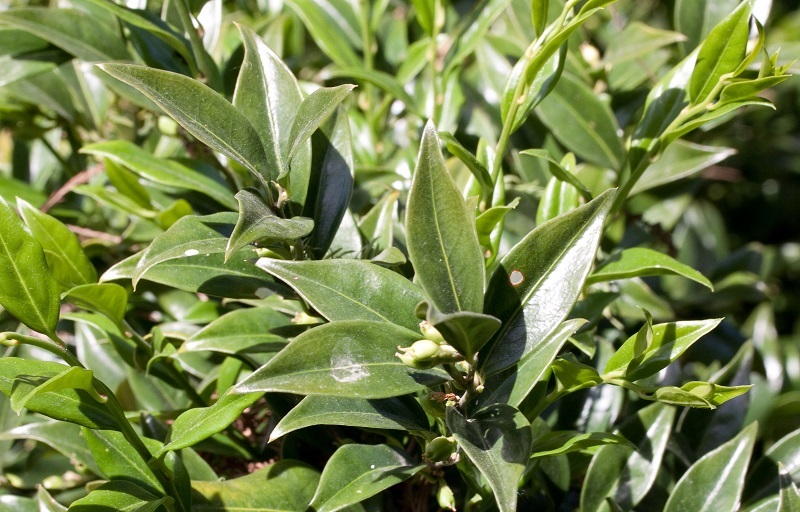 Tea plants will perform best in a sunny, sheltered position in sandy soil with a pH of 5 to 6. The 'Sweet Box' - Sarcococca confusa may not be particularly eye-catching, but when you stroll past a specimen in full winters bloom it is undeniably nose-catching, if such a conjoined word exists! The common name is in reference to its similarity to the common box, Buxus sempervirens. Under favourable conditions you can expect the sweet box to reach a mature height of 2 metres with a width of 1 metre. It is a compact, evergreen shrub with glossy, green, ovate leaves and a spreading habit. The origins of Sarcococca confusa are uncertain but it is generally believed to derive from China. Strangely it is not matched by any wild specimen, but there is some belief that it may have been raised from seeds collected by Ernest Henry 'Chinese' Wilson (1876 – 1930) in Western China. It was subsequently brought under cultivation in England around 1916. The most notable feature of the sweet box is its highly fragrant, honey-scented blooms. The white flowers with cream-coloured anthers appear over the winter and once pollinated are followed by glossy, black berries 5 mm in diameter. In fact the genus name Sarcococca originates from the Greek meaning 'fleshy berry', referring to the fruit. It is also tolerant of atmospheric pollution, and once established will also be tolerant of drought and neglect. Like the true box - Buxus sempervirens, it is ideal for creating an informal low hedge. Sarcococca confusa received the Award of Garden Merit in 1984. If you are a keen gardener and love tea then you may be tempted to try and grow your own tea plant - Camellia sinensis, and process the leaf tips for your own consumption. While there are many Camellia species and cultivars familiar to British gardeners, Camellia sinensis is grown mainly in tropical and subtropical climates and as such is not considered hardy. That being said, some tea varieties are surprisingly cold hardy once established and have proven to shrug off all but the worst weather England has to offer. It is also tolerate of coastal climates. As such there are small, specialist tea plantations (using the 'Clonal One' cultivar) under cultivation in Cornwall in the United Kingdom, and rather surprisingly Perthshire in Scotland. You may be interested to know that Perthshire tea company 'The Wee Tea Company' won the honour of being the best tea in the world at the 'Salon de The' awards in Paris in 2015 for their Dalreoch smoked white tea! Tea plants are usually grown in regions which receive at least 125 cm of rainfall a year in rich, moist soil in full to part sun, so these conditions will need to be replicated as best as possible in the UK with the likelihood of winter protection required. When left to their own devices, tea plants can reach a height of approximately 15 metres. However, for ease of harvesting, tea plants are usually kept to waist height. It takes 3-4 years for a newly planted tea plant to be established enough to cope with leaf harvesting. Under favourable conditions a tea plant will grow a new flush every seven to 15 days during the growing season. Leaves that are slow in development tend to produce a better-flavoured tea which is why Perthshire tea growers produce some of the best leaves in the world. To keep it simple for cold protection, consider growing a tea plant in as large pot as you can comfortably move to a protected area when necessary. The key to successful cultivation is the rooting medium. It will need to be well-drained, moisture-retentive, slightly acidic compost. That can be achieved by mixing equal parts John Innes 'No3' compost, ericaceous compost and well-rotted farm manure and lime-free horticultural grit. 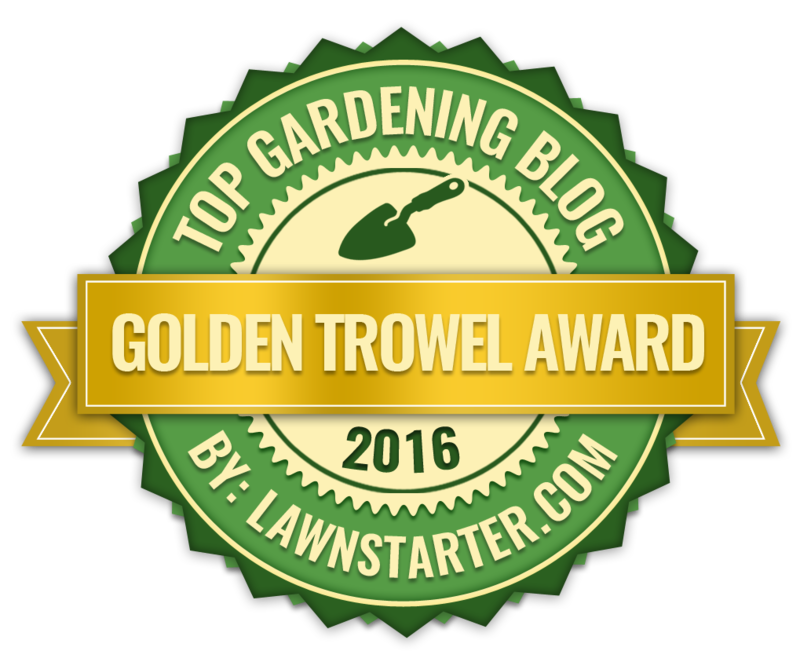 It will perform best in full sun but will the compost must be kept moist at all times during the growing season to prevent the growing tips from drying out. That being said, do not allow the soil to become waterlogged as the roots can easily perish under this conditions. Feed with a liquid soluble acidic fertilizer once every couple of weeks during the growing period. Once temperatures look to start dropping below 7 degrees Celsius move your pot grown specimen to a frost free position such as an unheated greenhouse. Once spring temperatures rise, and the threat of late frosts have passed, your tea plant will need to be acclimatised for a week or two before being left outside in their final position. Despite being associated with tropical and subtropical climates the tea plant is surprisingly robust in all by the worst of our British climate. However when cultivated for tea leaves the plant can be cropped more frequently and provide a better quality product when grown in favourable conditions. Ideally a south-facing, terraced hillside can provide the sunny aspect combined with good drainage, although irrigation may be required over the summer. Enrich the soil prior to planting with well-rotted farm manure and mulch every autumn taking care not to have the mulch touch the plants trunk. WHAT PLANT DO YOU GET TEA FROM? If you are English then you are likely to have a strong emotional (and possibly addictive) relationship with tea. 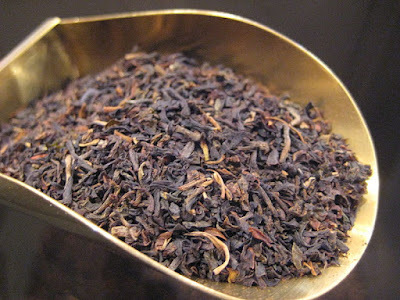 However besides from knowing that tea is made from an infusion of processed tea leaves then it is also likely that you will not know from which plant the tea leaves are from. The origins of tea date back so far into history that it is impossible to say when it was first drunk but records show that it was originally taken as a medicinal beverage in Southwest China approximately 3000 years ago, prior to it first becoming popular as a recreational drink during the Chinese Tang dynasty (618 - 907). Tea came to the attention of the English during the 17th century after being brought back to Europe in the 16th Century by Portuguese merchants. The plant from which you get tea is called camellia sinensis, the genus name of which will be familiar to most gardeners. The traditional Chinese name for Camellia literally means 'Tea flower', while the wester name is in honour of Rev. Georg Kamel (1661–1706), pharmacist, and missionary to the Philippines and who incidentally did not discover or name this plant, or any other Camellia species. The species name 'sinensis' is Latin for 'from China'. Camellia sinensis is an evergreen shrub with broad, glossy leaves. The young leaves emerge light green in colour, darkening as they mature. Under cultivation tea plants are usually kept at a height of approximately 1.5-2 metres to make it easy to pick the fresh leaf tips. 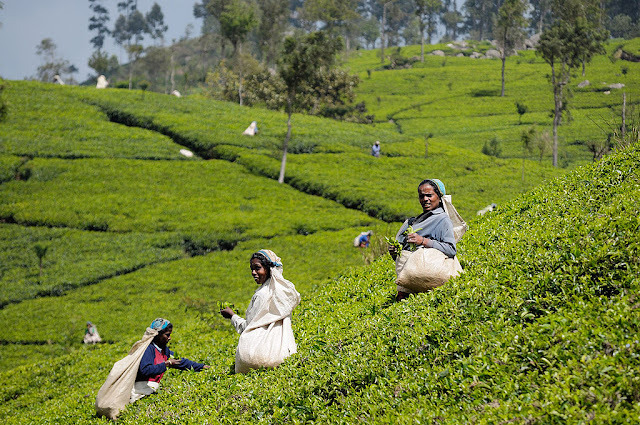 When picked for tea production only the top 2–5 centimeters of the mature plant are picked. These buds and leaves are known as 'flushes'. A tea plant will typically grow a new flush every seven to 15 days during the growing season in subtropical to tropical climates. When left to its own devices you can expect a mature tea plant to reach a height of 16 metres. Unfortunately it is only considered to be half hardy and cannot be grown outside in England without winter protection. The mandarin orange - Citrus reticulata, is one of those true species and as such will grow true from seed, and luckily enough is relatively easy to germinate. 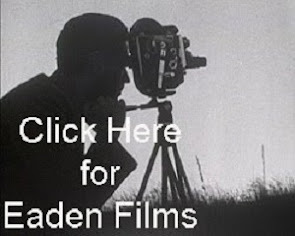 To begin with you will need to obtain fresh viable seed. This can be achieved by collecting your own seed from shop bought fruit or purchase your own from a reputable online seed retailer. Self-collected fruit will need to be cleaned so that any pulp has been removed and will be ready for immediate planting without any further preparation. Purchased seeds are likely to have dried off a little and as such will need to be soaked for 12-24 hours in tepid water. Using modular seed tray or small terracotta pots (approximately 7-9 cm in diameter) filled with a good quality soil-based compost such as John Innes 'Seed and Cutting', sow in seed per pot or module approximately 1 cm deep. Gently water in and move to the warmest, brightest part of the house but without direct sunlight and keeping the soil moist but not waterlogged at all times. Watering can be reduced by placing the trays or pots under a covering plated of Perspex or glass or keep them inside a clear, sealed polythene bag. This will also help to maintain high humidity. Germination times are directly affected by soil temperature and that can be improved by placing the pots or tray inside a heated propagator at a temperature at approximately 18-22 degrees Celsius. You can expect germination to occur from 14 days onwards, however germination will be erratic. That being said, viability of mandarin seeds is high so don't throw un-germinated seeds away until they gave been allowed a month or two to emerge. Once the seeds have reached 3-4 inches high they can be potted on in to a larger pot with slightly acidic, richer soil-based compost. 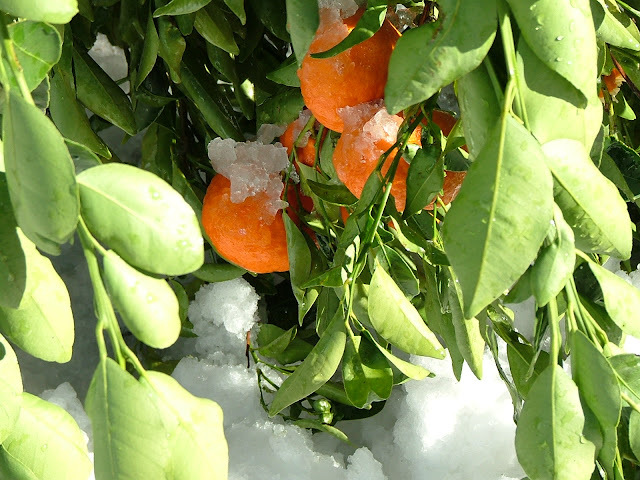 In regions prone to freezing conditions your mandarin plants can be grown as a houseplant or as a container plant outside once they have been acclimatised for a week or so before being left in sunny conditions. Be aware that Mandarins will need to be brought back under protection once overnight temperatures reach 6-7 degrees Celsius. Do not re-acclimatise in the spring until the threat of late frosts have passed. Keep the compost moist and feed with a liquid soluble citrus fertiliser ever couple of weeks during the growing season.